FT AC-17. 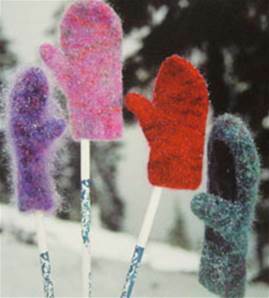 Perfect for snowball fights and Xmas gifts - mittens for teens, women and men, felted to fit your hand. Knitted in 2 strands worsted (approx aran) yarn. Small 110m, medium 128m, large 153m each of two worsted (approx aran) yarns. 8mm dpns and optional 8mm x 60cm circular needle.. Tension approx 11st to 4in before felting.